User-generated content (UGC) is any content—text, videos, images, reviews, etc.—created by people, rather than brands. And brands will often share UGC on their own social media accounts, website, and other marketing channels. For many brands, Instagram is the primary platform for UGC. Users create and share posts featuring your brand, exposing your products and services to their audience. Better yet, you can share that content with your own audience, boosting your credibility in the process. In this post, we’ll explain why you should create a user generated content strategy. We’ll also explain how to incorporate UGC into your social marketing efforts. 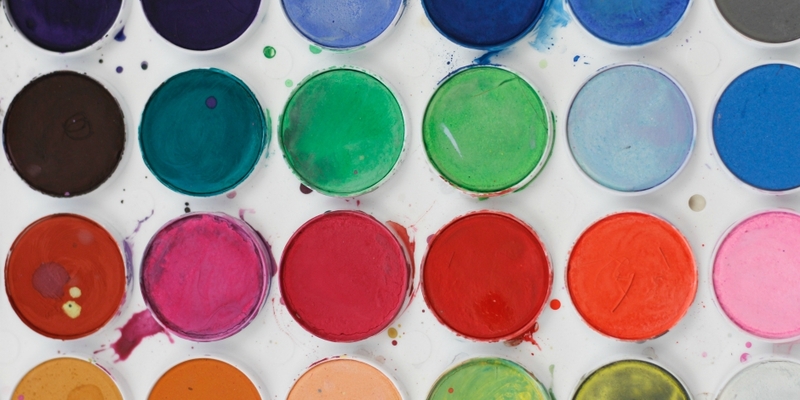 What’s the big deal about user-generated content, and why should your brand care? Here are three key reasons UGC is a key marketing strategy you can’t ignore. Consumers are 2.4 times more likely to view user-generated content as authentic compared to content created by brands. That offers brands an important credibility boost, since most people say less than half of brands create authentic content. This cute image of a baby wearing Warby Parker glasses racked up more than 15,000 likes and inspired comments like “I die of cute.” Had the brand staged this image with an actor and high production values, would the audience have been so moved? Whether it’s a product, a service, or an experience, modern consumers want to know what they’re going to get before they order. For example, 30 percent of millennials would not go to a restaurant if the location’s Instagram presence was not up to snuff. They just don’t trust that the experience would be what they are looking for. Keep in mind that those diners are checking the restaurant’s own profile and content from other customers. It’s all about creating trust. A full 92 percent of consumers trust recommendations from people they know, and 70 percent trust online consumer opinions. Burt’s Bees shares customer testimonials about their products along with UGC on Instagram. This helps to boost, followers’ trust in the products and the brand. Burt’s Bees Satin Lipstick in Magenta Rush ???? “The formula is very moisturizing, light weight & comfortable, smooth on lips & well pigmented. Made of 100% natural ingredients.” ???? : @deepikamakeup #burtsbeesbeauty #magentarush Share your favorite Burt’s products with us and you could be featured on our social and website! ???? 1) Follow @BurtsBees ???? 2) Post a photo of your favorite Burt’s products ???????? 3) Tag @burtsbees and use #myburtsbees in the post copy ???? All of the preceding benefits of user-generated content really lead up to this one: the impact on purchasing decisions. And it’s a biggie. Nearly 80 percent of people say UGC has a high impact on their purchasing decisions. Don’t forget Instagram Stories when sharing user-generated content designed to drive purchases. Combining the immediacy of Stories with the staying power of Highlights, you can create a lasting album that lets potential buyers keep watching for as long as they need to feel comfortable heading to your website to buy. 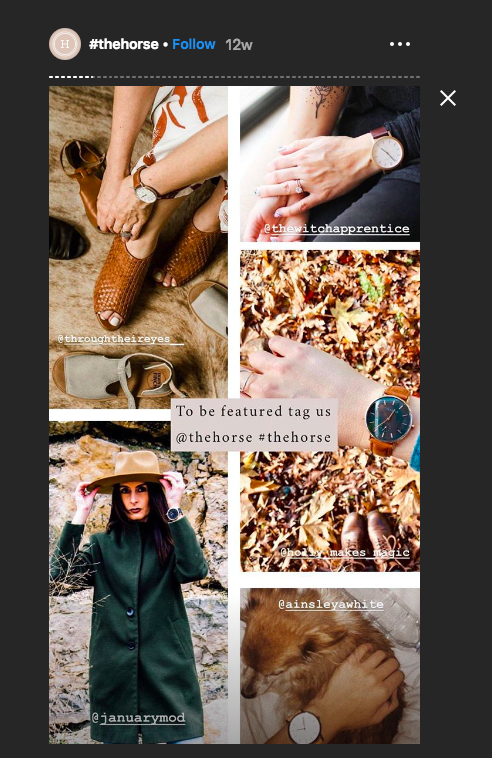 For example, The Horse has more than 70 user-generated content examples in their #thehorse Insta Story, showing their watches in different contexts. If you’re not incorporating user-generated content marketing, you’re missing out on a powerful tool that can lead directly to more sales. Humans are by nature an envious bunch. Sharing exceptional user-generated content is a great way to spark brand desire. For tourism and lifestyle brands, it’s especially powerful to showcase your destination through a visitor’s lens. 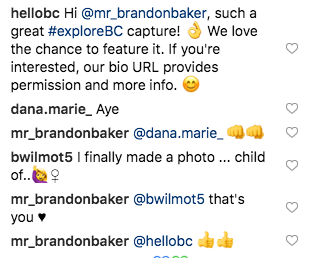 Destination British Columbia uses UGC on their Instagram account to showcase beautiful scenes from across the province in a way that feels accessible to the everyday traveler. The user-generated content examples they share rack up thousands of likes and inspire followers to parts of the province they may never have visited (or even heard of) before. Of course, this strategy works for products, too. Everlane recently promoted its new rainboots through a user-generated content campaign on Instagram showing how different the boots are from traditional Wellingtons. No rain required. ✔️ @seaandpattern wears her Rain Boot in black. It was a great way to create consumer desire for a new product leading into the spring rainy season. Creating desire is all about getting people to experience your brand for the first time. Building brand loyalty is about fostering long-term relationships that result in multiple sales over time. People who create and share user-generated content are likely to be among your biggest fans. They have probably bought from you more than once. If they have only made one purchase, it was probably a meaningful one. UGC allows you to harness that brand excitement and foster a sense of ongoing loyalty in people who may be less familiar with your brand. Color Street is a direct marketing company that sells artistic nail polish strips through independent stylists. They regularly share user-generated content examples on their social channels. Because their customers are also their salespeople, sharing their content creates a feeling of brand support, driving ongoing loyalty. Regardless of your sales model, sharing UGC can help build brand loyalty by showcasing how much you care about the customer experience. It can be a constant challenge to create new, fresh, great-looking content for your social media channels. User-generated content campaigns are a way to help build out your content library so you’ve always got relevant material to share. 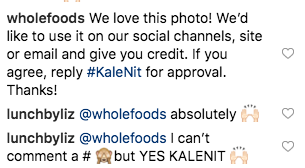 Whole Foods uses the hashtag #WholeFoodsHaul to encourage shoppers to share photos of what’s in their shopping cart. It’s a great, ongoing source of content that is visually consistent and aligns with the brand’s Instagram look. As shown above, a branded hashtag is a great way to collect user-generated content. However, it’s a good idea to ask for permission even when a post includes your tag. Hashtags can sometimes take on a life of their own, and people may use your branded hashtags without necessarily knowing you’ve tied them to a user-generated content campaign. Re-sharing that content without explicit permission is a surefire way to kill goodwill and annoy some of your best band advocates. 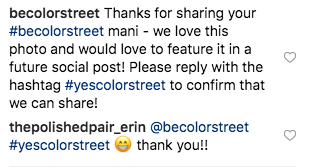 When you ask permission, you show the original poster that you appreciate their content and get them excited about sharing their post with your audience. You also keep yourself out of hot water when it comes to copyright concerns. Plus, it’s just the right thing to do. When you share user-generated content on your social media channels, make sure to give clear credit to the original creator. Tag them directly in the post. Indicate whether you’re using their visuals, their words, or both. Always give credit where credit is due. If you plan to share user-generated content across social media platforms, check for how the creator wants to be credited on the various channels. For example, if you want to share a photo from Instagram on your Facebook page, ask the original creator if they have a Facebook page you could tag. Providing proper credit is an important way to recognize the work of content creators, and helps make sure they stay excited about using and posting about your brand. It has the added benefit of making it easy for fans and followers to verify that the content really was created by someone outside of your firm. If you want fans and followers to provide you with user-generated content, you have to offer them something in return. A social media contest can be a great way to bring in a substantial amount of UGC quickly. But don’t get too focused on rewarding UGC creators with prizes. One survey found that only 32 percent of consumers created and shared UGC because they wanted to win a prize. Instead, 60 percent said they shared UGC to get more likes, or to have their content featured by a major brand. That’s great news for brands, because it means you can use a branded hashtag to bring in a steady supply of user-generated content marketing options all year long, as long as you regularly share the best contributions with appropriate credit for the content creators. The more you share UGC, the more people will be motivated to tag you in posts they think you might want to share. UGC creators want you to share their content. That means they want you to tell them what kind of content you’re most likely to share. Only 16 percent of brands offer clear guidelines on what kind of user-generated content they want fans to create and share. But more than half of consumers want brands to tell them exactly what to do when it comes to UGC. Don’t be afraid to get really specific. Make it easy for people to share content that fits your needs. Of course, that means you need to have a clear understanding of what you want to get from UGC. Like any marketing tool, user-generated content marketing requires a strategy. Sure, it’s nice when people tag you in pretty pictures. But how can you use that content to support your marketing goals? Sit down with your social media strategy document and look for ways that UGC aligns with your existing marketing goals. Then, create a simple statement based on that information that tells users exactly what kind of content you’re mostly likely to feature. If you focus on collecting user-generated content only when users tag you or use your branded hashtag, you’re missing out on tons of potential content. As part of your social listening program, you should be keeping an eye out for all mentions of your brand or your products on social media, even if you’re not tagged. If you find a post you’d like to share with your audience, get in touch with the content creator and ask permission. They may be less keen than someone who has tagged you or used your branded hashtag, but the worst they can say is no. If they say yes, be sure to let them know about your UGC branded hashtag and encourage them to use it in future posts. In addition to being a powerful marketing resource, user-generated content is also a great source of customer research. Make sure you allow the time to look at the UGC your fans create and analyze it for lessons that could help improve your social marketing efforts. For example, you might discover fans are using your products or services in ways you hadn’t considered. Or, you might see that they like to use your products in combination with another product. This could create an opportunity for you to partner with another brand. On the flip side, think about images you expected to see but that fans didn’t create. Use this information – or lack of information – to examine your assumptions about how people think about your products and your brand. Also take a look at the hashtags people use in combination with your branded hashtag. You might uncover some emerging hashtag communities you’re not yet aware of. Lastly, take a look at the language people use in their user-generated content posts. What kinds of words are they using when they talk about your products or services? You might uncover new ways of thinking or talking about your offering that better align with the ways consumers already perceive your brand. Use Hootsuite to manage all your social channels from a singe dashboard. Easily publish and schedule posts, engage your audience, run ads, and measure performance. Try it free today.